sunbathed swimming pool; an elegant and refined atmosphere. reserve for its guests an unforgettable and unique experience. stay in a country side environnment. three kitchens an optimal flexibility hosting a maximum of 12 adult people . and toilet, washing machine. Separate entrance. and a large double bed room, bathroom, toilet and balcony. parking place for guests and visitors. appennin forest(50 km).Podere Pilar is ideal for a relaxing holiday in the heart of Tuscany and only a few kilometres from famous cities such as Florence, Lucca, Pisa, Pistoia, Siena. You can also enjoy the nearby spa centres of Montecatini and Monsummano. The Podere Pilar is an ideal holiday place characterized by the peace and tranquillity of the area offering complete relaxation thanks to the surrounding park and the day long sunbathed swimming pool; an elegant and refined atmosphere. Immersed in green vegetation, surrounded by 800 olive trees (that produce the well known Montalbano extra-virgin olive oil) from where the Panorama dominates the hills planes painted by Leonardo, the country holiday at Podere Pilar, typical Tuscan residence reserve for its guests an unforgettable and unique experience. The artist Giuseppe Gioffrè and his wife Laura open the doors of their home “Podere Pilar” to every form of art, in particular painting, that they love to enjoy together with their colleagues, young artists or simply lovers of art, in the most picturesque corners of their property. Easels are put at the disposition of any interested guests. .Here in Tuscany art and tourism go hand in hand, every view, every corner, every small rural or historical hamlet is art in itself. Since his youth, alongside his studies and, later his profession, he has passionately dedicated himself to painting “sublime interpretation of beauty” as so defined by the great Leonardo da Vinci. The beauty of Podere Pilàr Do you know the land where lemons flourish? In the green foliage Golden oranges shine A slight breeze blows from the blue sky Quiet is the Myrtle, serene bay leaf You know him well? Over there, Yonder I with thee, o my beloved, go! Podere Pilar is situated in the lovely hills of the community of Monsummano Terme. 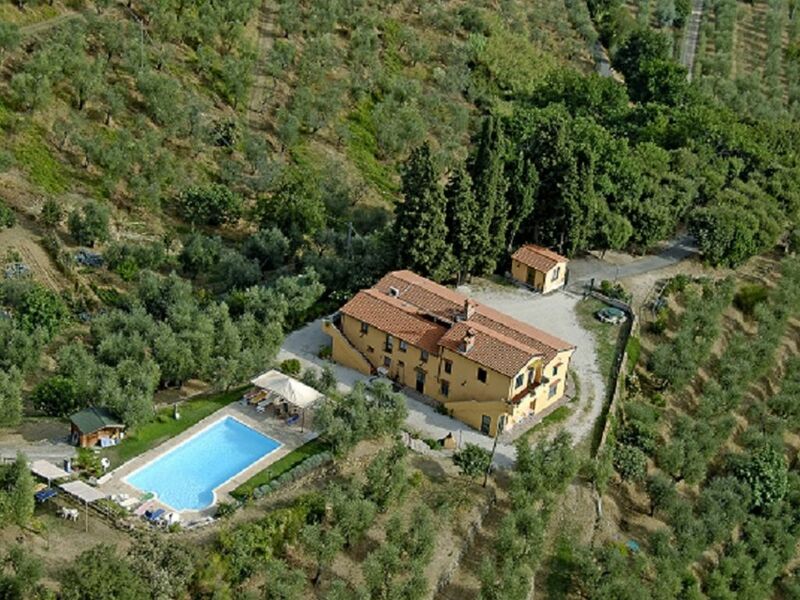 It is a typical tuscany landhouse in the middle of olives trees (eight hundreds on four hectars) on various terrasses connected by small pathes, all inviting for a walk. In doing so we can enjoy the perfect architecture of the medieval village of Montevettolini wich is only 500 metres away. In altitude of 150-200 m. we are enjoying a mediterranean cliimate protected from cold winds, with an open view to the west and south in direction of the sea offering a medieval and "medici" tipical impression inviting for meditations and a really relaxing stay in a country side environnment. each room has his private and indipendent bathroom. There is ,too, at ground floor 1 bathroom, suitable for every guest, also for them with reduced mobility, near the area of living and setting room. in each room at first floor of the villa; it is not necessary at ground floor. there are 3 washing machines: 2 at ground floor. 1 at first floor in case the whole villa is rented for 12 people. living room at groundfloor with direct access to the garden in front of the villa, suitable for 12 people; other living/dining area at first floor in case the whole villa is rented for 12 people. full large kitchen, 5 fires, with entrance directly from the pork; other similar on the first floor in case the whole villa is rented for 12 people. satellite TV in living room, ground floor , in living area apartment first floor, in 1 bedroom first floor in case the whole villa is rented for 12 people. DVD in living room ground floor and in 1 double bed room , ground floor. at ground floor from the front of the house,dining, living ,kitchen, are accessible with a wheelchair; one large bedroom at ground floor, from the garden of the house is accessible with a wheelchair; its bathroom is accessible,too, for people with reduced mob from ility. NOTES ON ACCOMODATION The house was built in 1811 and recently renovated . It offers the typical characteristic of a country house in this region of Tuscany and is perfectly suited for an extraordinary farm holiday. It is furnished in a modern and purposeful way and thus satisfies the expectations of rural atmosphere. On two floors with a total of 400mq it offers because of three separate entrances, quiet and privacy in all of its part. First floor has air conditioning. House very suitable for families with children. OUTSIDE: Behind the house luxurious swimming pool (6x12m with stair entry, depth 1.20x2.10m), to be reached by stairs or two little pathways, cold and warm shower, big terrace surrounded by plants and flowers, large sunroof with chairs and tables and everything you may need for a complete relaxation from sunrise to sunset. Large grill to prepare meals. Boccia field with illumination in the midst of olives trees. Fitness room. Front part of the house with 2 open air sitting places with benches, tables. Close to the entry gate parking place for guests and visitors. We had an awesome 2 weeks at this lovely villa. Location was perfect, the villa in great condition and the pool area just fantastic. The owners couldn’t do enough to ensure we had a great stay. Highly recommend this lovely place. Molte grazie per la bella recensione. Noi ci sforziamo di rendere interessante e piacevole la vacanza degli ospiti nella nostra proprietà, invitandoli a godere della bellezza che ci circonda in un rapporto con la natura semplice e rispettoso. Perfect for a family vacation. Suitable for reunion, celebration or a getaway. You could describe it as a little paradise or some might say nirvana. One certainly can’t say enough great things about location, privacy, peace and relaxation offered by this unique property. It has everything we needed and more. All ages and all needs were met - be it for loud fun in the swimming pool, large lunch/dinner barbecues for family and friends or quite time for an afternoon siesta. The owners are delightful and helpful. There is plenty to see and do in the area and easy to take the train to Florence but be back in time for dinner al fresco. Plenty of supermarkets and dining options. We stayed in because the grill is great and we had small children- which meant they could go to bed, while the adults stayed up late. I highly recommend this property. My family thought is was great and had a marvelous time. We will return!! We had a lovely 9 day stay at Podere Pilar. The villa was spacious, clean and very well equipped. The pool was lovely, also very clean and there were plenty of seats and sun loungers for all of our party ( 8 people). The villa is surrounded by olive groves and the views are stunning. The small village of Montevettolini is on a nearby hill and is about a 10 minute walk away. It is about a 10 minute drive to local supermarkets and Florence and Pisa are also easily accessible. The owners Guiseppe and Laura are very friendly and were very kind to us, leaving us vegetables and fruit from their garden as well as a delicious bottle of olive oil. I would thoroughly recommend Podere Pilar to anyone looking to enjoy a holiday in Tuscany. The artist Giuseppe Gioffrè and his wife Laura open the doors of their home ‘Podere Pilar’ to every form of art, in particular painting, that they love to enjoy together with their colleagues, young artist or simply lovers of art, in the most picturesque corners of their property. Easels are put at the disposition of any interested guests. The owners prefer to rent the house to those families which know how to appreciate the beauty of the nature. Podere Pilar is ideal for a relaxing holiday in the heart of Tuscany and only a few kilometres from famous cities such as Florence, Lucca, Pisa, Pistoia, Siena. You can also enjoy the nearby spa centres of Montecatini and Monsummano. Distance to beaches 50km. Viareggio and Torre del Lago-Puccini. Pisa and Florence airports 50km. Car is essential. Montevettolini 500m. Monsummano Terme 3km. Pistoia 16km. Lucca 30km. Firenze 50km. Siena 90km. S.Gimignano e Volterra 70km.